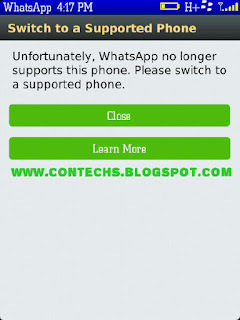 News came that some Blackberry users were unable to continue using Whatsapp on their phones as it keeps popping up a massage " Unfornately, Whatsapp no longer supports this phone. Please switch to a supported phone. ". Well that was not supposed to have happened cause the Whatsapp deadline for Blackberry and other supposed unsupported phones was extended to 30th of June this year and this is still January. Though this massage had shown before December 2016 but it was lifted as soon as the deadline was extended. However most Blackberry users had to go to Blackberry App World and Update their Whatsapp before the massage stopped showing. So if your phone is among the Blackberry phones that the Unsupported massage came up on again, All you have to do is simply go to your Blackberry App World, Click on My World and scroll to Whatsapp and Update it and your Whatsapp should start working fine again so you can continue chatting with your friends and associates before 30th of June or when you upgrade to a supported device. 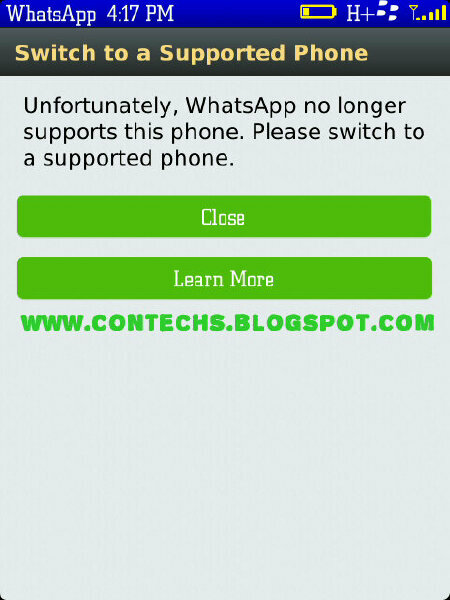 If you didn't see an option to update your Whatsapp app on Blackberry App World then you would have to uninstall your Whatsapp app and have it reinstalled from App World and it would start working. Have a Nice Day Chatting!